In its annual report examining the future of 5G mobile networks, data use and subscriber growth, Ericsson Mobility also included a segment on smartphone switching patterns. It examined trends among users upgrading to a new device on their existing carrier, and found that "the majority of smartphone users remain loyal to their operating system." The notable exception was Microsoft's Windows smartphone platform, which saw only 20 percent of its users upgrade to another Windows smartphone, while 82 percent of Android users and 73 percent of iOS users stuck to their existing platform when upgrading to a new phone, at least in the months prior to a new iPhone release. Prior to a new iPhone introduction by Apple, only 1.1 percent of subscribers upgrade to new iPhone on their existing carrier. Another 1.7 percent of subscribers are Android owners getting a new Android phone. Only about a third of one percent of all subscribers are iOS or Android users switching platforms. A much smaller number (0.07 percent) switch from Android to Windows phones, while most existing Windows users are defecting to Android (1.7 percent of all subscribers, the same number as those with an Android phone buying a new Android phone). However, Windows owners were more likely to stick with Windows than buy an iPhone. Regardless of the operating system in use, Ericsson found that "owners of high-end models were much more likely to select a new model in the same series from the same vendor than users of lower-end models." 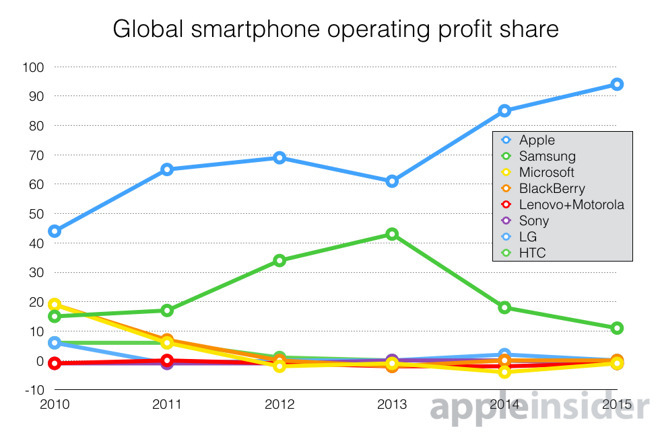 That trend became even more evident after a new iPhone release cycle. The report noted that in mature markets (where most users already have smartphones), "replacement purchases drive smartphone sales more than first time buyers do," and that "as many as 60 percent of iOS smartphone owners that switched to the newly launched model had devices that were only a year old." Overall, iOS upgrades after a new iPhone is introduced accounted for four times the typical upgrade rate, an unsurprising surge in iPhone buyers upgrading to new models. In the first two weeks of a new iPhone release, the iOS "upgrade loyalty" rate jumped from 73 to 93 percent. However, the rate of switchers leaping from Android or Windows smartphones to an iPhone doubled after a release cycle, shifting the relatively static balance of brand loyalty. A quarter of Android upgraders bought a new iPhone instead of another Android model. Android's loyalty rate falls from 82 percent to 76 percent. That cycle-induced switching was even more pronounced among Windows users, where more upgraders bought an iPhone than another Windows model. Ericsson noted that its data came from "a selected number of mature mobile broadband networks in Europe, Asia and North America," and noted that "other operating systems like Blackberry, Symbian and Firefox OS had very low penetration in all measured networks and therefore were not included." The surge in platform switching related to new iPhone introductions indicates that the media attention associated with new product launches appears to significantly help shake loose the platform loyalty of smartphone owners, who would otherwise be likely to stick with what they have. Given that the majority of Android devices are very low end models, this indicates that Apple's upgrade cycles are consistently battering away at the remaining installed base of higher end Android owners, enticing more of those to switch to iOS, either upgrading to a higher end phone than they already have, or simply giving up on premium Android models. Google's own effort to enhance Android's high end appeal, an initiative branded "Android Silver," failed to convince hardware makers to give Google more control over their devices. Last year, Google shifted to a low end strategy of attempting to make efficiency-priced phones better with Android One, but again failed for similar reasons. Google is now taking other stabs at fixing Android's flaws, including working with its licensees, including Samsung, to identify and fix some of the worst, easily exploitable security bugs in their third party additions to Android software on flagships such as the Galaxy S6 Edge. The company is also rumored to be exploring how it can partner with chip makers to get a handle on the hardware fragmentation and the increasingly large technology gap between chips available to Android makers and Apple's A-series Application Processors, two issues that make it much more difficult to roll out new features or otherwise compete with iPhones on the high end. Apple's introduction of iPhones with larger displays have eviscerated the demand for premium Android phones, particularly hitting Samsung's fablet business, which had been driving the company's profits. Apple is now reported to be earning 94 percent of global smartphone earnings as other device makers fight for low end, unprofitable sales volumes, most losing money while doing it. Speaking in Apple's latest earnings call, chief executive Tim Cook noted, "we believe that iPhone will grow in Q1, and we base that on what we're seeing from a switcher point of view. We recorded the highest rate on record for Android switchers last quarter at 30 percent. We also look at the number of people that have upgraded, that were in the install base prior to iPhone 6 and 6 Plus, and that number is in the low 30 percentages, so we feel like we have a very open field in front of us."